BROCKTON, Mass. 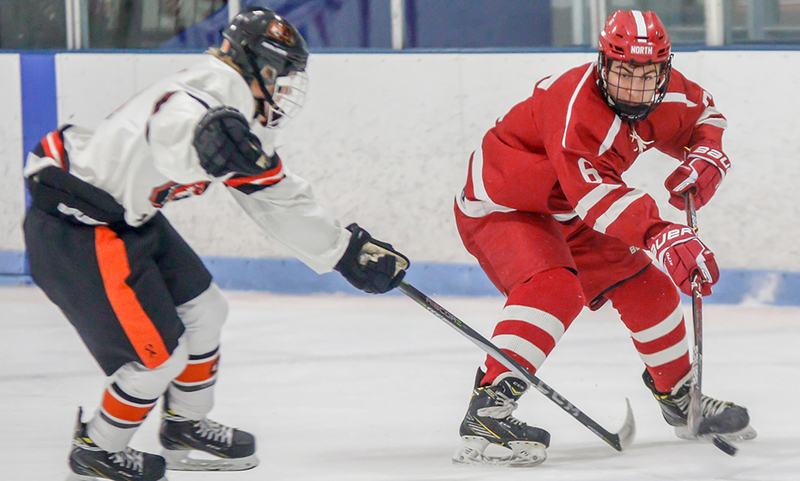 – After coming out on the wrong end of back-to-back, back-and-forth games, North Attleboro staged a third-period rally to earn two points on the road in a win over Oliver Ames. North was coming off narrow losses to both Mansfield and Fxzƒranklin despite having leads in both contests. Big Red took the lead in the first period but faced a 2-1 deficit heading into the final period. Junior Anthony Zammiello scored a natural hat trick in the final frame, helping the Rocketeers improve to 6-4-0 overall. Zammiello gave the Rocketeers an instant boost in the third period. Just 32 seconds into the final frame, Zammeilo was parked out in front of the goal, burying a rebound chance after a shot from the point was turned away by OA goalie Owen Connor (16 saves). Big Red capitalized on the momentum it picked up with the early tying goal. North’s first line struck again as Zammiello came away with a loose puck after a scrum to the right of the goal. The junior took a stride towards the slot and fired a low wrist shot to make it 3-2 with 9:34 to play. With the goalie pulled in the final minute, Zammiello completed the hat trick with an empty-net goal with just a second to play. “It’s big to score that early, obviously that’s what we want to do,” McManama added. “But the important thing is that the kids did what we asked them to do. OA blocks a lot of shots so we needed to find ways to get pucks in and also block out guys in front of the net. It was exactly what we had talked about and then they went out and executed. North Attleboro took the first lead of the game just over the midway point of the first period. Junior defenseman Brendan McHugh ripped a wrist shot that redirected by the traffic in front, leaving Connor with little chance for a save. Oliver Ames had three serious scoring chances that went without a goal in the first period. After a shot rocketed off the boards behind the net, the puck fell right in front of goal but freshman Ross Carroll had his shot go just over the bar. Senior Michael Nikiciukaa forced a big kick save from junior Ryan Warren (23 saves) and just seconds later Eric LeBlanc had his one-timer bid denied by Warren. But finally with just 3:15 left to play in the first, the Tigers broke through. Both sophomore Jake Gottwald and junior Jordan Bello made hustle plays to keep the puck in the attacking zone for OA. The puck then ended up on the stick of junior defenseman Matt McCormack, who rifled his shot from the blue line off the post and in for a 1-1 tie. It looked as though Oliver Ames had taken the lead in the first minute of the second period, but the referee ruled it no goal. Sophomore Ryan Gottwald moved the puck up ice to junior Brett Williams and it looked as though Williams’ hard shot hit the middle bar inside the goal and came out, but the ref waved it off. The Tigers did take the lead four minutes later. After a save on a shot from the point, LeBlanc gained possession and skated behind the net, firing a hard pass to junior Colin Bourne for a one-timer and a 2-1 lead. North Attleboro hockey (2-2 Hockomock, 6-4 overall) is back in action on Monday when it hosts Milton at 12:30. Oliver Ames (1-2, 3-4) will travel to Walpole on the same day with a 2:40 start.